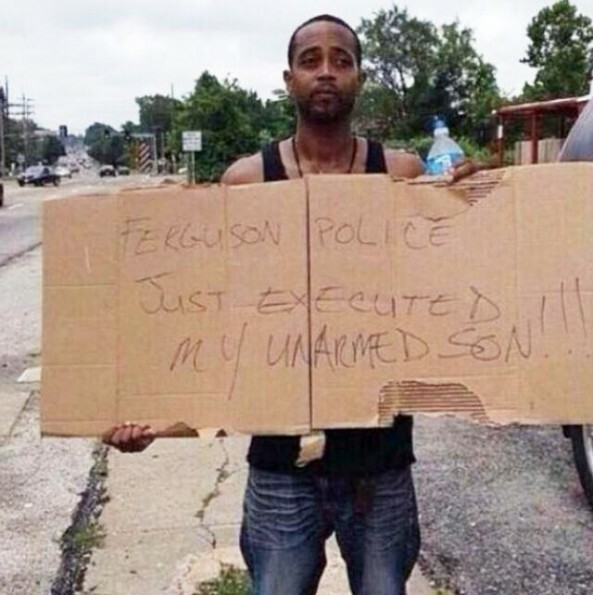 On Twitter, I saw the picture of Mike Brown’s father holding a cardboard sign saying, “Ferguson police just executed my unarmed son!! !” A few days later, I watched the livestream of protesters being tear gassed in Ferguson, literally with my hand over my mouth in shock. There were the pictures of protesters doused in milk to ease the tear gas and the waves of police officers in riot gear with armored cars. Countless images of young black men with their hands in the air: hands up, don’t shoot. I cannot get these images, and the real lived experiences of what was captured, out of my head. The post-9/11 mantra of “if you see something, say something” made us fearful of the forgotten backpack and the unknown stranger. But seeing the images from Ferguson compels me to do something, say something, do anything, say anything that can help those strangers. I just don’t know what it is yet. My professional work supports advocacy for reproductive rights, and I read a number of articles asserting the right and ability to safely raise a child is a reproductive justice issue. At first I was annoyed because it felt attention-grabbing and potentially alienating. The more I read and thought about it, the more I came to see it as a living embodiment of Audre Lorde’s assertion that we don’t live single-issue lives. And if the movement I work in and for is going to focus our grassroots people-power on supporting something else I feel strongly about, more power to them - literally. The shooting of Mike Brown violated the the due process clause in the 14th Amendment and the first weeks in Ferguson brought violations of every part of the First Amendment - free speech and freedom of the press, assembly, and religion. How images of police tactics in Ferguson were similar to ones used to suppress the civil rights movement in the 50s and 60s. If municipality revenue structures depend on income from fines, poor people will bear the brunt of the systematic classism, and those day-to-day injustices of the system fuel these protests. How entrenched systems like when and how elections occur contribute to the unbalanced racial makeup of Ferguson’s elected officials . Why Fargo, ND spent $8 million on militarizing their police force. A contrast of different privileges afforded to anti-choice “sidewalk counselors” vs. Ferguson protesters. The complicated way religion and religious convictions (specifically Christianity) are used by the police, and also by clergy standing in solidarity with protesters. How pop culture reveals cultural narratives of abuses of power and authority. 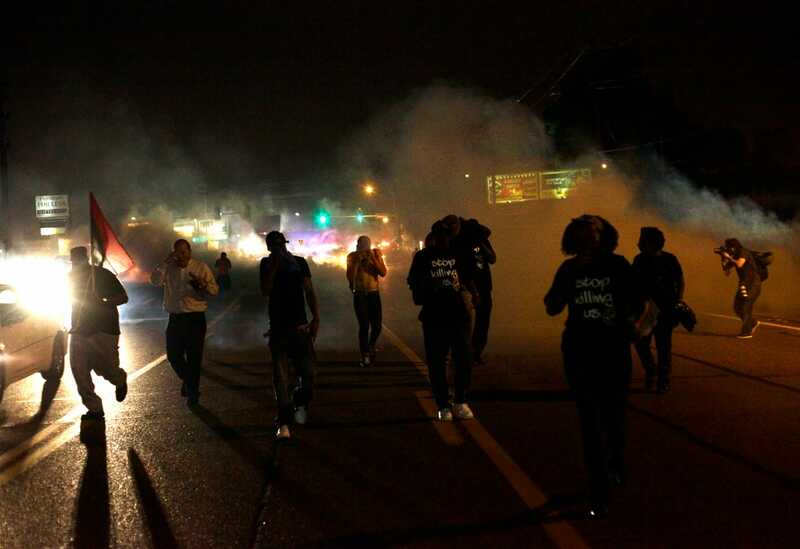 I want to not feel powerless about what happened to Mike Brown and what is happening in Ferguson. My first thought was to donate to organizations providing job experience and training like Tree Trust or Cookie Cart (full disclosure: my spouse is employed by Tree Trust). But Mike Brown was shot while walking down the street, regardless of his job or educational status. So while these organizations do good work, my donation won’t prevent another black man from being shot. So my next idea was to write my mayor and state legislators asking about the militarization of our police forces and body cameras on police officers. Shortly after Mike Brown’s death, Mayor Betsy Hodges announced Minneapolis will be piloting a body camera program with officers this fall and her staff forwarded my questions about militarization on to the Minneapolis Police Department. I’m waiting for their response. And yet, according to this New York Times map, state and local authorities in Hennepin County have 324 assault rifles, three grenade launchers, two armored vehicles, and other military grade gear. Ramsey County has 992 assault rifles, 76 night vision pieces, 40 pistols, three helicopters, and one armored vehicle. Considering we’re hosting the Super Bowl in 2018, I honestly doubt we will demilitarize anytime soon. The Twin Cities has our own fair share of police brutalization reports - activist Al Flowers alleged MPD officers beat him before arresting him in his home this summer, and last year, Chris Lollie was tasered in the St. Paul skyway while waiting to pick his kids up from school. There are other examples of the systematic racism in Minnesota - we have one of the worst achievement gaps in the nation and we have a history of literally bulldozing black neighborhoods. To see is to bear witness. To bear witness demands we speak, and that we speak truth, and that we speak that truth to power. I’m reminded, however, that this is not my lived experience to tell. As a person with privilege, I need to do a lot of listening. I need to practice empathy. I need ask myself how I contribute to inequality and unbalanced power structures. And I’m not always going to get it right. I’m probably going to be insensitive and do or say or feel something racist, because implicit racial bias exists (test yourself here). And when I’m called out on getting it wrong, I need to listen some more. So where do we go from here? Finding an equitable resolution, grounded in justice, will take time and work. The grand jury has until January to bring an indictment against Officer Darren Wilson, and there are serious doubts about the ability to have an impartial judicial process. And the issues of Ferguson will continue to stretch and tangle in unexpected ways, just to remind us that we do not live single issues lives. As for me, I’m just going to try my best to do justice, love mercy and walk humbly and take the small actions I can to create a world where everyone matters.